Posted at: 9/24/2010 07:23:00 PM . Have you checked your credit score recently? 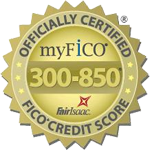 MyFico.com is currently providing free credit scores with no catch. Just use the promo code FICOFAN and the $15 fee will be waived. The site has two different features, so make sure you scroll down to the one time purchase so that you are not enrolled in a program with a monthly fee. This is a really great deal because your annual free credit report doesn't show you the number, just the information. I've heard a few people mention that the code is moody and doesn't work everytime, but just click "apply code" a few times and it should work. I was able to get it on my first try. Just a side note about credit reports: As many of you know, you can get a free credit report once a year from annualcreditreport.com which is run by the government. Other sites, with catchy commercials, will give you your free credit report but will also sign you up for credit monitoring which charges you a monthly fee. Privacy Notice: While I have linked directly to both sites, I highly recommend typing the addresses directly into your browser instead of clicking the links. This will make sure that your information is secure because some blogger widgets or browser toolbars can alter links to monetize when possible. Please read the site's disclaimer for more information.